The $30,000 Rea Award for the Short Story is awarded to ALICE MUNRO. Sponsored annually by the Dungannon Foundation, the Rea Award for the Short Story was established in 1986 by the late Michael M. Rea to honor a living United States or Canadian writer who has made a significant contribution to the short story form. It was Michael Rea’s desire to encourage writers to maintain loyalty to the art of short fiction and to ennoble the form. The only award in the U. S. exclusively for the short story, it is given not for one specific work, but rather for literary power, originality and influence on the genre. The recipient is nominated and selected by a jury of distinguished writers. For many years the Canadian writer Alice Munro has astonished her readers with stories that are magical and wise. The magic is in her art as a storyteller, in her exquisitely modulated prose — lyrical, exacting, at times comical — which captures the lives of her characters, both women and men, attempting to understand their personal histories in the larger sweep of history. Munro’s configuration of time is Chekovian, supple in its bright flashes of insight, connection; shadowed in its strokes of disappointment, separation and loss. Long honored as a master of short fiction, Munro’s searching narrators often draw the reader to contemplate the devices of storytelling itself, the mysterious ways in which we distort reality, reconfigure the past to avoid or embrace revelation. Munro’s wisdom lies in her ability to portray the close-up, the self-dramatizing moment or limited vision then draw back for the complex and informing view. As one of her most endearing characters discovers, you can “look up from your life of the moment and feel the world crackling beyond the walls.” In her art of the story, Alice Munro encourages us to reflect, to see our own time and place and perhaps to redeem, if not ourselves, at least our own stories in the larger setting of the world. Described by The New York Times as “the only living writer in the English language to have made a major career out of short fiction alone,” Munro’s work has been compared to that of Flannery O’Connor, George Eliot, and Anton Chekhov. Her most recent collection, The Love of a Good Woman (1998), was praised by the Times as “standing on the high plateau of achievement” already occupied by her earlier collections: Dance of the Happy Shades, Something I’ve Been Meaning to Tell You, The Beggar Maid, The Moons of Jupiter, The Progress of Love, Friend of my Youth, Open Secrets, and Selected Stories. 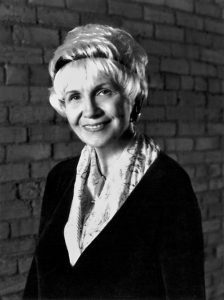 During her distinguished career, Alice Munro has been the recipient of many awards and prizes, including three Governor General’s Literary Awards: Canada’s highest; the Lannan Literary Award; the W.H. Smith Award, given to Open Secrets as the best book published in the United Kingdom in 1995; and the 1998 National Book Critics Circle Award for The Love of a Good Woman. Her stories have appeared in The New Yorker, Atlantic Monthly, The Paris Review, and other publications, and her collections have been translated into thirteen languages. Her new book, Hateship, Friendship, Courtship, Loveship, Marriage, a collection of stories, will be published in November 2001.